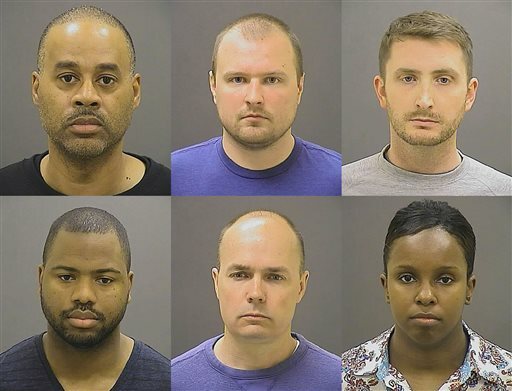 The indictments announced Thursday were similar to the charges Baltimore State’s Attorney Marilyn Mosby announced three weeks ago. The most serious charge for each officer, ranging from second-degree “depraved heart” murder to assault, stood, though some of the lesser alleged offenses had changed. Attorneys for the officers have said in court documents they are the victims of an “overzealous prosecution” riddled with personal and political conflicts of interest. At a minimum, they said, Mosby should be replaced with an independent prosecutor because she had a personal interest in calming unrest in the city that followed Gray’s death and because her husband is a city councilman who represents the areas most affected by upheaval. Gray suffered a critical spinal injury April 12 after police handcuffed, shackled and placed him head-first into a van, Mosby has said. His pleas for medical attention were repeatedly ignored. His death a week later spawned protests that on two occasions gave way to violence and looting. In the wake of the riots, Democratic Mayor Stephanie Rawlings-Blake implemented a curfew and Republican Gov. Larry Hogan declared a state of emergency. Mosby said prosecutors presented evidence to the grand jury for the past two weeks. Some of the charges were changed based on new information, but she didn’t say what that was. She also did not take questions. Two officers, Edward Nero and Garrett Miller, were indicted on second-degree assault, reckless endangerment and misconduct in office for “failure to perform a duty regarding the safety of a prisoner” and for an illegal arrest, Mosby said. The indictments do not include the false-imprisonment charge both officers initially faced. “I’m very glad that the grand jury chose not to indict officer Nero on false imprisonment and one count of second-degree assault. I’m quite confident he will be acquitted of the remaining charges at trial,” Nero’s defense attorney, Marc Zayon, said. Caesar Goodson, who drove the van, faces manslaughter and a second-degree “depraved heart” murder charge, as well as misconduct in office and second-degree assault. Sgt. Alicia White, Lt. Brian Rice and Officer William Porter are each charged with manslaughter, second-degree assault and misconduct in office. Those officers also face reckless-endangerment charges. Gray’s death became a symbol of what protesters say is a pattern of police brutality against African-Americans in Baltimore. Following Gray’s death, the Justice Department announced a civil rights investigation of the Baltimore Police Department to search for discriminatory policing practices and examine allegations that officers too often use excessive force and make unconstitutional searches and arrests. Gray was arrested in the Sandtown-Winchester neighborhood of West Baltimore. According to court documents, he made eye contact with a police officer and took off running. He was apprehended two blocks away and arrested for possession of a knife that Miller wrote in charging documents is illegal under a city ordinance. Mosby said the arrest was unlawful because the knife is legal under state law. None of the officers secured Gray’s seatbelt in the van, a violation of police policy. Soon after he was placed in the van, Goodson made a second stop during which Gray was secured in leg irons because he was “irate,” police said. After a ride that included two more stops, including one to pick up a second passenger, the van arrived at the Western District police station. By that time, Gray was non-responsive. The Rev. Cortly “C.D.” Witherspoon, president of the Southern Christian Leadership Conference’s Baltimore chapter, said he was surprised by the indictments. “The track record of this city and state’s attorney’s office and even the grand jury in Baltimore is not to indict in these type cases,” he said. In the neighborhood where Gray was arrested, the news was received Thursday evening more with a shrug than a cheer. “We ain’t worried about the indictment. We want a conviction,” said Michael Banks, 44. Lisa Logan, an HIV-awareness advocate, said she’s glad the case is proceeding. But she doesn’t understand why the van driver faces more serious charges than the officers who put Gray in the van. Associated Press writer David Dishneau contributed to this report.